"Robert Wyatt, OBI Box Set - 5 Miinis"
ROBERT WYATT - Japanese OBI MINI REPLICA LP TITLES making a 5 CD Box Set- Japanese OBI MINI REPLICA BOX SET Japanese re-mastered Mini LP replica Limited Edition Collection Recorded from the finest Original Masters available. Each title Comes with anti-static sleeves similar to Vinyl LPs, Cardboard packaging exact to the original LP, Re-sealable plastic wrap cases for protection of each collectible and includes extensive Liner Notes Booklet. Actual miniaturized version of the 12" LP in 4" CD version Special VERY RARE LIMITED EDITION BOX SET ONLY PRODUCED ON FUTURES FOR THIS ONE TIME PRESSING -- were only available in Japan. 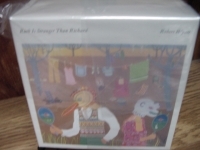 Limited Japanese ROBERT WYATT box includes THESE 5 Japanese OBI MINI REPLICA LP'S. - RUTH IS STRANGER THAN - Japanese reissue of 1975 album, packaged in a miniature LP sleeve Track Listings 1. Muddy Mouse (A) 2. Solar Flares 3. Muddy Mouse (B) 4. 5 Black Notes and 1 White Note 5. Muddy Mouse (C)/Muddy Mouth 6. Soup Song 7. Sonia 8. Team Spirit 9. Song for Che OLD ROTTENCOAT - Japanese reissue of 1985 album, packaged in a miniature LP sleeve Track Listings 1. Alliance 2. United States of Amnesia 3. East Timor 4. Speechless [Instrumental] 5. Age of Self 6. Vandalusia 7. British Road 8. Mass Medium 9. Gharbzadegi 10. P.L.A. NOTHING CAN STOP US - Japanese reissue of 1981 compilation, packaged in a miniature LP sleeve Track Listings 1. Born Again Cretin 2. At Last I Am Free 3. Caimanera 4. Grass 5. Stalin Wasn't Stallin' 6. Red Flag 7. Strange Fruit 8. Arauco 9. Trade Union - Kadir Durvesh, , Esmail Sheikh, 10. Stalingrad - Peter Blackman DONDESTAN - Japanese reissue of 1991 album that's unavailable in the US, packaged in a miniature LP sleeve Costa," the album's opening track, begins with a droning synthesizer, soon followed by Wyatt's sublime voice. Immediately, the album's hypnotic tone is set, and Benge's mysterious lyrics only add to the mood. Wyatt's always spry cymbal and tom work drives the song's groove on top of the subdued keys. The song fades, and "The Sight of the Wind" fades in--Wyatt's a cappella percussion is ghostly above the (again) hypnotic synth lines, and the jazzy inflection of Wyatt's voice delivers Benge's lines with his inimitable interpretive flair--could any other singer evoke as much emotion out of the word "Sanskrit"? "Catholic Architecture" is peaceful and dreamy ("lovingly lacerated hands" must be one of the most beautiful phrases Wyatt has sung), powered by a spare piano line, and "Worship" is a great lounge-style tune. The music gets jazzy with "CP Jeebies," which could easily have fit with the Communist Party sentiments on Old Rottenhat. "Left On Man" has a great groove, with the background vocals repeating "simplify, reduce, oversimplify." By the end of "Dondestan," the synthesizers suggest that the album is ready to start over again Track Listings 1. Costa 2. Sight of the Wind 3. Catholic Architecture 4. Worship 5. Shrinkrap 6. CB Jeebies 7. Left on Man 8. Lisp Service [Tracks 7 & 8] 9. N.I.O. (New Information Order) 10. Dondestan [Tracks 9 & 10] & SHLEEP - Japanese reissue of 1997 album, packaged in a miniature LP sleeve. Includes the bonus track 'September In The Rain'. Track Listings 1. Heaps of Sheep 2. Duchess 3. Maryan 4. Was a Friend 5. Free Will and Testament 6. September the Ninth 7. Alien 8. Out of Season 9. Sunday in Madrid 10. Blues in Bob Minor 11. Whole Point of No Return 12. September in the Rain [*] These are Japanese digitally re-mastered Mini LP replica CDs (the OBI Edition). This Limited Edition Collection has only VERY FEW made world-wide and are immediately Out of Print. Recorded from the finest Original Masters available. Comes with anti-static sleeves similar to Vinyl LPs, Cardboard packaging like an LP, includes extensive Liner Notes Booklet. Actual miniaturized version of the 12inch LP in 4inch CD version.